Want to know where you can find Jack Daniel's® mustards near you? Enter some information below and we'll show you. Look for Jack Daniel's Mustards in the condiments aisle. Select Product: Select... Jack Daniel's Chipotle Mustard 9 oz. Jack Daniel's Honey Dijon Mustard 9 oz. 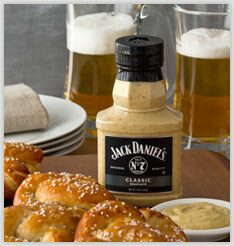 Jack Daniel's Horseradish Mustard 9 oz. Jack Daniel's Jalapeno Mustard 9 oz. Jack Daniel's Old No. 7 Mustard 9 oz. Jack Daniel's Whole Grain Mustard 9 oz.